One of the reasons photographers love to shoot black-and-white film and develop the negatives themselves is because of the myriad of ways to develop the film and the subtle differences that come from that variety. When we visualize the final image in our mind’s eye, at the moment of exposure, we also need to factor in how we will develop the film and what kind of effect or mood we want to achieve. Today, I am very pleased to interview my photography teacher, mentor and friend Crombie McNeill on the ‘McNeill 2-stage formula stand development’ that he has crafted through his years of professional film photography. Crombie, welcome to Clear-Photography. We’re here today to discuss stand development. For anyone unaccustomed, could you give a brief explanation on what this means? We all want our images to have detail in both the shadows and highlights and this obviously begins with careful exposure, and exposure alone cannot assure this. Stand development is based on the chemical action producing density on the negative relative to exposure. During development the highlight areas of the negative rapidly gain density (opacity) while the shadow areas lag behind. The developer in direct contact with the negative’s surface becomes exhausted very quickly on the areas of heaviest exposure (highlights) and so agitation brings fresh aggressive developer to these areas while the the shadows areas haven’t come close to exhausting the developer. The result is excessive density in highlights with weak shadows. With ‘stand’ developing the developer is made less aggressive by greatly increased dilution, and with virtually no agitation this allows the developer to exhaust in the dense areas while the developer continues to work on the shadows. The processing times are extended from 1 to 2 hours. I’ve diluted D76 at 1:20 and processed for 2 hours with agitation only for the first minute and then for 10 seconds after 1 hour. The actual dilution will vary depending on what you’re using. Keep in mind at some point the highly diluted developer will become totally exhausted so even an extra 2-3 hours will not add any density to either the shadows or highlights, but could add some fog, which is another interesting story. This processing technique is effective to improve shadow details without blocking the highlights, unfortunately it does have some occasional pitfalls related to uneven developement and streamers. Another short coming is the shadows tend to be a little flat, lacking crispness and punch, and the solution to all of this is 2 stage processing. What are the origins of 2-stage stand development? Two stage development really peaked in the 1950’s when the fanatical European Leica shooters were seeking the absolute sharpest and finest grain images obtainable from an Adox film intended for copying documents. All sorts of experimentation ensued and even today some of these exotic formulas are still used by some purists.How important is the order and timing of each developer?The first stage is ‘stand’ processing, and 1 hour should be considered the minimum and remember this only to kick-start the shadows. The second stage is your normal processing time, minus 20% or there about. The order and effects of stages 1 and 2 must not be changed. However, the processing times and dilutions are not etched in stone, so do some experimenting. You’ll see this processing concept will certainly improve both the shadow and highlights and all critical mid tones will likely be improved as well. What kind of lighting scenario would this type of developing best be suited? This specific processing technique I’ve conjured up is ideal for any high contrast scene and produces a delicate ‘picturesque’ quality very similar to landscapes associated with the 1920-30’s. The tonal range is outstanding. The sun reflecting off the snow was painful and I could hardly see into the shadows. The exposure was not pulled, 1/250 f11. I went inside the shed and made careful reflected readings. I had previously processed a roll diluted at 1:30 and fixed it without the 2nd stage developing stage to determine the density of the first stage and these negatives were thin but printable, and in my judgement had more density than was wanted. Processing was all in Ilford Microphen. First stage was at 1:60 for 1.5 hours with agitation every 30 minutes, I mixed 3 drops of Kodak Photo-Flo into the tank to help prevent air bells. The second stage was again Microphen diluted at 1:4 for 12 minutes with 5 second agitation intervals every minute. McNeilll 2-stage Stand Development. Crombie McNeill. This is a wonderful example of the 2-stage development process. Clearly, we can still see detail in both the very bright snow and very dark interior of the shed. I’ve chosen the scene with the children for my own example. 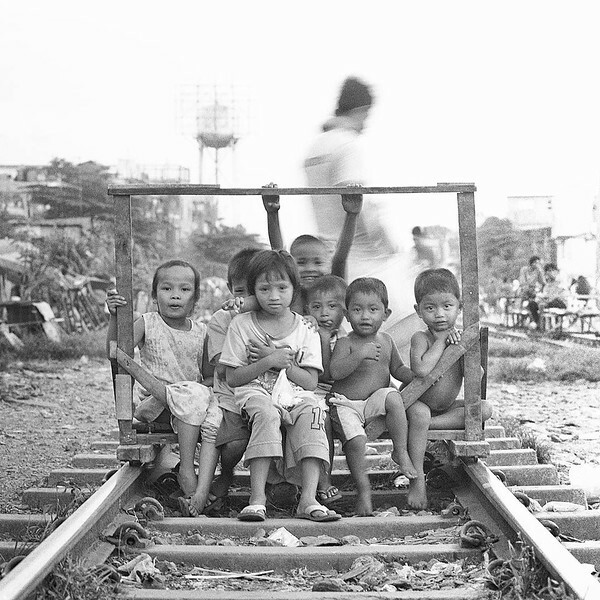 This was shot with a Hasselblad in the Daang Hari area of Taguig city, Philippines. This is Ilford HP5 shot at ISO 400. The first stage is Blazinal at 1:300 for 1.5 hours. I agitated for the first minute only. The 2nd stage is Kodak HC-110 at 1:75 for 16minutes. Agitation was performed twice in the first minute only. Because it is 2-stages we have the option of choosing 1 or 2 developers. What are the benefits of choosing 2 over just 1 developer? Using the same developer for both stages will certainly work, but if a more active developer like Rodinal or Microphen is used for the first stage this will give added snap to the shadows which is needed since ‘stand’ processing produces low contrast negatives. The 2nd stage developer should be biased more for the highlights, and a natural for this would be Ilford Ilfosol or Kodak D76 diluted at 1:30. My inclination is for Ilfosol, but be aware this excellent developer has a short shelf life. In his book, ‘The Negative’, Ansel Adams says that when using a 2-step diluted solution, extra exposure is required in the shadow areas, in general one zone higher. Do you meter your scenes differently when planning this type of processing as opposed to normal development? There is a failing with Ansel’s 2-step, and he recognizes this by advising +1 exposure for the shadows. With mine, the shadows are given density and sparkle without any extra exposure. 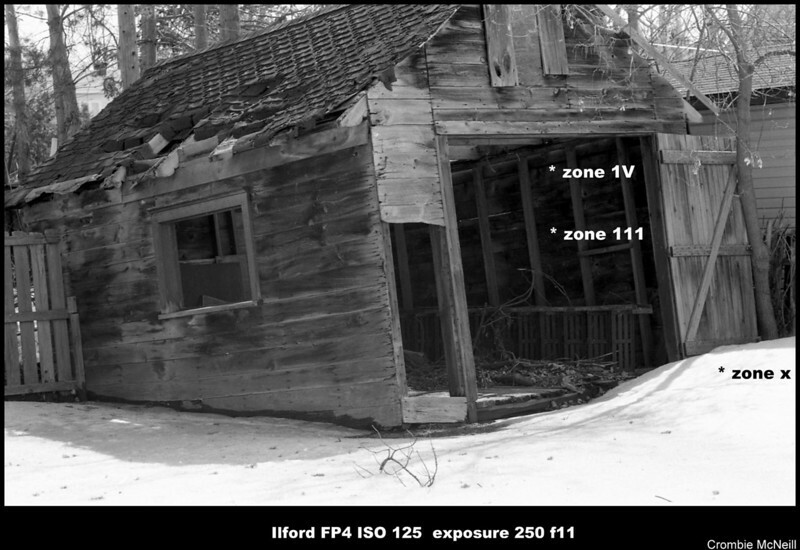 And keep in mind extra exposure forces the highlights into zones 10 and oblivion. I don’t meter any differently. There’s a universal problem with exposure, and it’s how an individual photographer uses the cameras meter or a handheld. One shooter says the rating of X film is really this while another says that’s nuts because it’s really Z, while yet another says 0. This goes on and on, and what is a perfect negative for shooter A is junk for shooter B, so unless we have densitometers, and know how to use them, it’s subjective. You’ve been a pro shooter (film and digital) for many years now. With digital technology making leaps and bounds, why are you still shooting film? And what does putting a loupe to your eye and viewing a 6×6 negative impress upon you that viewing a digital negative on a computer does not? I have only one client who appreciates b&w film, but the rest expect digital, and if offered film they wouldn’t even know how to respond. That said, 90% of my ‘art’ images are film based, and it’s here that film is the hands down winner. Recently a jury of artists who’s medium was water colours and acrylics went though a selection of my photography. They had no background in photography. When all was said and done they selected 4 images, which was the max for any artist, and all were film images, yet I’d submitted over 20 images and not a single digital photo was selected. Electronic images no matter the quality, are electronic bits scattered about on a piece of metal substance. A negative is a physical entity that is tactile…it’s there, in your hand. And it’s been in your hand during it’s lengthy birth to a negative. When viewed on a monitor even the visually uneducated see the difference, not where it’s better, but the difference is immediately recognized. For myself I’ve always made an effort to set myself aside from the crowd, and quality of a different order was my strength throughout my career, and so it continues. Thank you to Crombie McNeill for his insight into yet another way to develop your black and white film. If you are in the Ottawa area, look him up for the latest information on photography workshops, mentorship, fine art or new commissioned works.